Hakea pycnoneura is a rounded shrub that reaches a height of two metres by the same width. Leaves are linear and up to 15 centimetres long with prominent veins. They tend to be greyish with silky hairs. The globular flower clusters are carried in leaf axils. Purplish buds open with purplish-pink perianths and long cream styles. Blooms are very fragrant. Honeyeaters are attracted to the flowers. Our specimen flowered for the first time in August 2013 after two years in the ground. 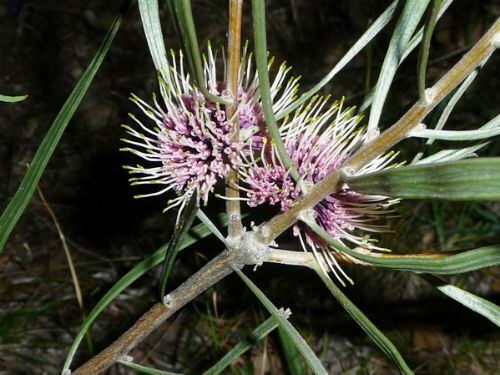 The flower clusters are similar in appearance to the better known Hakea petiolaris. The flowers are followed by clusters of woody fruits that hold two winged seeds. Hakea pycnoneura would make a fragrant hedge or screening plant. Some years ago, on a trip to south-western Western Australia, we came across this species growing on a roadside. We were attracted by the strong flower perfume and handsome blooms. The species name refers to the close venation of the leaves.